PICK A BRAND AND A SYSTEM AND STAY WITH IT! Just stand in a pool store and listen to people looking for help in curing their cloudy water, algae growth, smelly water, and more. A glaringly disproportionate amount of them share two distinct traits: they have a sand filter, and they use whichever chemicals are on sale; whenever they really need them. So, they shock after the pool turns cloudy, they use algaecide after the pool turns green, and they buy antibiotics after they get an infection. They think they are saving money. They are; just like you can save money by never changing the oil in your car until the engine seizes. Here’s what they miss: there are not really that many nice days in a northern summer. If you miss 25% of the nice days, because there’s something wrong with your pool, and your next door neighbor uses their pool every nice day, you just spent 25% more money per day that you used your pool, compared to your neighbor. Does 25% sound too high? Remember that pools turn when it is really hot and your are using them a lot. In other words, during the best pool weather! The most important. This prevents the transmission of diseases that could hurt you or kill you; such as staph, E. coli, Legionnaires Disease, Cryptosporidium, and much more. Sanitizers also kill and prevent algae growth: the green stuff that looks and smells bad. The three government-approved sanitizers are chlorine, bromine, and PHMB (Baquacil). Sanitizers need to be working in your pool every minute of every day. The next most important. Shocks are oxidizers that burn off impurities that are too small to be filtered. The best shocks are also capable of destroying dangerous bacteria and viruses (plus algae) at a higher level than the sanitizer does. Cryptosporidium, for instance, is not killed well by low levels of chlorine; as was found when so many people became sick (and a few died) from chlorinated drinking water in Ohio in the early 1990’s.Shocks really only need to work for minutes. Think of a flash fire. They can remain in the water longer, but don’t particularly need to do so. 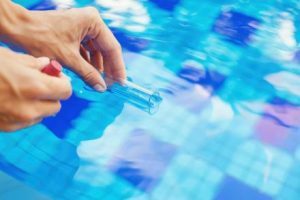 Chlorine-based pools need to be shocked weekly, because chlorine pools often need to have combined chlorine broken down into free chlorine (that’s a long story). Just trust me. Bromine based pools can get by with shocking every week or two, as combined bromine is not as dramatically worse for you as free bromine. PHMB based pools can get by with monthly shocking because there is no such thing as combined or free PHMB. Actually, you don’t really need algaecide. Your sanitizer kills algae. However, it’s really lame to not use it. First, algaecide is much more efficient at killing algae. Second, it’s way cheaper than any sanitizer. So $20 worth of algaecide will save you $40 to $80 in sanitizer. If your sanitizer is not getting used up killing algae, it leaves it in the water to kill things that can kill you. A system of regular chemical use that prevents problems, and protects your pool, your equipment, and you. All components are designed to work together to prevent reactions from incompatible ingredients. This three-part system, by the way, is your responsibility as a pool owner. It is very important. The pool’s pH also needs to be controlled; being absolutely critical in chlorine-based chemistry. There is also a more long-term subject in pool care, called water balance. It is permanent (or at least it would be if it didn’t rain in your pool and you never added anything to it). It certainly does not change quickly. Have it tested by your pool store two or three times a season, touch it up and you’ll be fine. Important test times are just after opening and just before closing. Less important, but worth checking, is mid-season, especially if you’ve had a lot of use, rain, or evaporation. What systems do we have? Bioguard®: The best in chlorine and bromine. The best research labs, the best dealer training, the most advanced products, the latest technology in chlorine and bromine. Actually they also have every technology, such as PHMB (Softswim) and salt-to-chlorine generation (Mineral Springs). Bioguard’s three-step systems are already labeled as 1 – 2 – 3 right on the label. A great chlorine-in-the-skimmer system uses Smart Sticks ™ and Smart Shock ™ with Back-Up ™ or another algaecide. The Smart Sticks are a patented formulation that stops dissolving when the water stops rushing by it. That protects your equipment and lets you put a week’s worth of Smart Sticks in your skimmer, and it will actually last for a week! Baquacil®: The best in PHMB technology. They invented PHMB; for use in the Stuart Pharmaceuticals’ product Hypocleanse. Surgeons wash their hands in it before surgery. It is also used in agriculture and contact lens cleaning solution. Worldwide, Baquacil is the largest brand of PHMB, and the second largest brand of any pool chemical. Under other names, they also make chlorine and bromine. Baquacil has the best research labs, the best dealer training, the most advanced product and the latest technology in PHMB. When we have a problem to solve in a PHMB pool, they give us the best tools. Baquacil’s three-step system is all liquid, very gentle, very safe, and very easy. Test once a week (it takes 20 seconds) and add a little algaecide. Shock once a month (and you can swim 15 minutes later). Add a little sanitizer whenever you need it. No bleached bathing suits or liners, no green hair, no bleach-odor, just clear, soft water. Our most popular brand and system. Target ™: A great New England brand of chlorine and high quality products at very competitive prices. Make your own system from a wide variety of choices. Chlorines: Stabilized granules, plus mini-tabs (the best form of chlorine), jumbo tabs (pucks), and slow sticks. Shocks: Liquid Super Shock ™, powdered Pool Burn™, and swim right after shocking with Shock N Swim™. Algaecides: Algaestroy 50, Metal-Free 60, No-Foam, and Algae Bomb. Plus every type of balancer, clarifier, filter aid, stabilizer, and much more. Featuring Bee Kleer™, the absolute best treatment for hazy or cloudy water made. Relax ™: Once a week pool care in a box. Nothing could be simpler. Drop a few tablets in your skimmer once a month, and add a bottle of Once-A-Week…once a week. Actually it’s a 3-step system that looks like a 2-step system. People love it! One box is all you need for a month. Compatible with Target™ balancers and specialties if you need them— made by the same people. The Others: Now these are not complete systems. You would use them with components of another system. Nature2 mineral ionization reduces your chlorine levels while protecting you and your pool. Learn more details on the Pool Tips ™ on Purification by going to the Pool Tips ™Index page. New Water chlorine cartridges fit a very special chlorinator by King Technology. We don’t carry the chlorinator, but we’ll help you out with replacement parts and cartridges. Robelle Pool Supply (our old parent company) and hth Poolife, provide our chemicals for smaller kiddy pools, splasher pools, blow-up pools, etc. When your pool is too small to use concentrated chemicals—or you are used to weaker discount store brands. Even those big 100 pound drums of calcium hypochlorite: We’re not too proud to carry them, too!